Set Design, Devon Drohan; Composer, Deborah Morris; Costume Designer, Elizabeth Magas. Cast: Bella Pelz (Moth), Caitlin Kraft (Boyet), Caroline Calkins (Rosaline), Dara Silverman (Katharine/Sir Nathaniel),David Bertoldi (Berowne), Devante Owens(Dumaine), Emily Eldridge-Ingram (Maria/Dull), Fiona Herter (Forester), Lori Evans (Holofernes), Luke Haskell (Costard), Madeleine Maggio (Longaville/Jaquenetta), Rory Hammond (Princess of France), Rylan Morsbach (King of Navarre), Thomas Reynolds (Don Armado), Cindy Wade (Marcade). A play of love and folly, Love’s Labor’s Lost, begins with a pact. The King of Navarre and his Lords Berowne, Dumaine and Longaville take an oath to study for three years without worldly pleasures. Women are forbidden, and must remain a mile from the court. 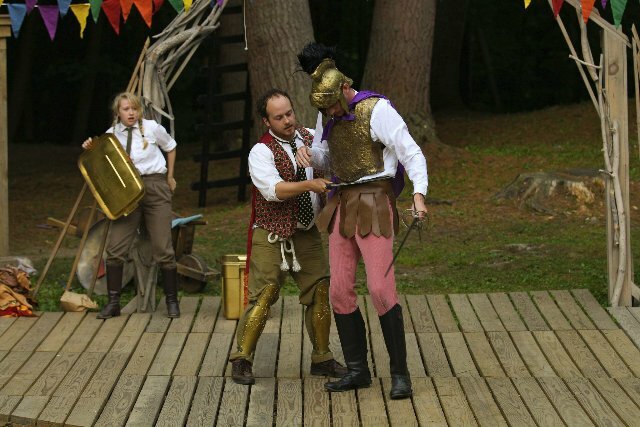 What ensues is a delightful farce echoing the delights and yearnings of a stay at summer camp. Once aware of the nearby presence of the Princess of France and her ladies, arriving on a diplomatic mission regarding a dispute over the region, all bets are off. The Royal Ladies, because of the edict, are forced to camp in the field, enjoying romping about and practicing their archery. But the Lords of Navarre have become smitten with the visiting Ladies, and proceed to write passionate letters to them. The director, Kelly Galvin, uses her skills to shape this play on the beautiful grounds of The Dell at The Mount. It provides a perfect setting. 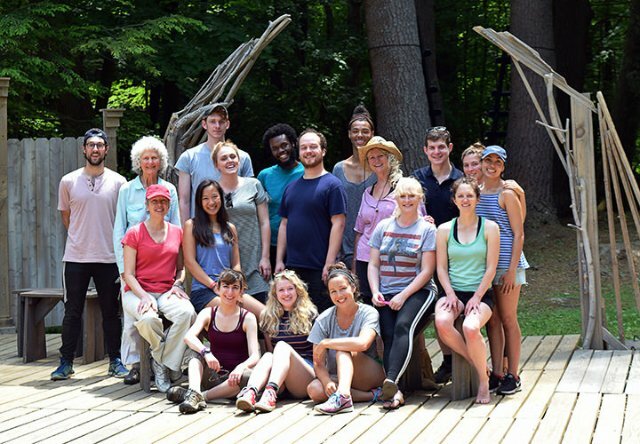 Previously spending six years teaching at Lenox Memorial High School during Shakespeare & Company’s Fall Festival of Shakespeare, Galvin uses the considerable talents of this cast, ranging in age from 22 to 32, to ramp up the comedy in this coming-of-age story. The self-imposed constraints become harder and harder to abide, as the charms of the Princess of France (performed with grace and confidence by Rory Hammond), and her Ladies come to the fore. As the play progresses, and love letters are delivered, The King, Berowne, Dumaine and Longaville realize they want to overthrow their vows and woo the Royal Ladies. In a very amusing twist, they disguise themselves as Russians, red Cossacks and all. With advance warning, the Ladies wear masks to confuse their identities and when all meet, folly and love explode! Playful duels and singing ensue, they are well directed and executed, considering the short three week rehearsal period. In the end, true identities are revealed and love declared. However, the Ladies are called back to France on bad news, with promises of a return visit twelve months hence. David Bertoldi as Berowne makes his mark as a frustrated lover. Thomas Reynolds excelled as Don Armado in a hilarious performance. 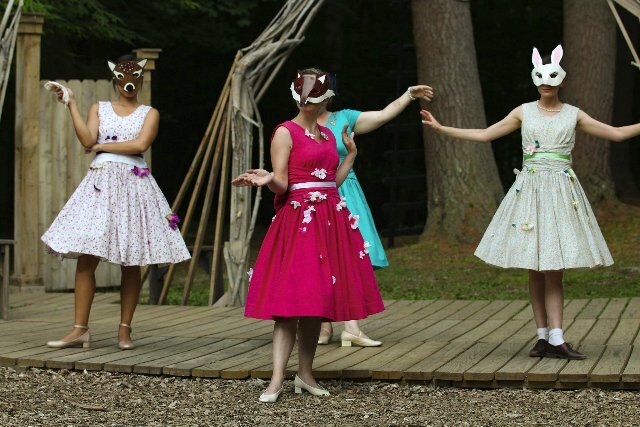 Important to the play is the connection to nature and its ability to strip away inhibitions and make the characters open to their playful natures. 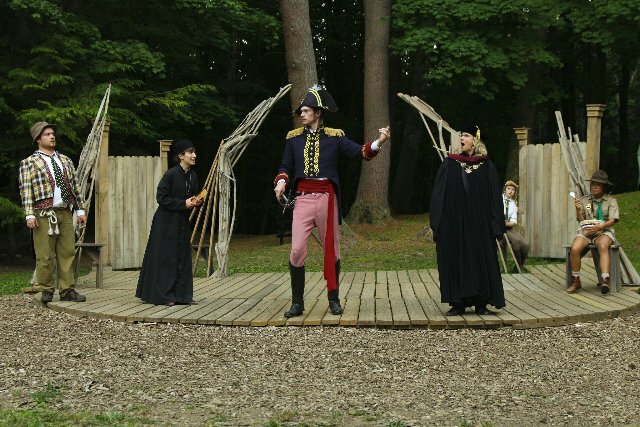 The memories of summer camp or summer play among audience members comes back as the characters remind us of what it is to have fun and folly in nature. The Magic of Shakespeare is at The Dell at The Mount!